*images for illustrative purposes only. If you need a car that blends into the background, look somewhere else. Nissan's Juke is a small SUV that's sold like hot cakes and the latest update keeps the design extreme but adds smarter looks, extra equipment and more personalisation options. The Nissan Juke is wilfully weird but it's hit a nerve with British buyers who love the thing. Jonathan Crouch takes a look at the updated version. By most accepted rules of vehicle marketing, this shouldn't happen. For a car with as divisive a look as the Nissan Juke to rack up such huge sales would suggest that those who love it really love it. The usual template is for the big sellers in a range to be conservatively-styled while the niche models on the periphery are ones that car manufacturers can afford to take the odd risk with. 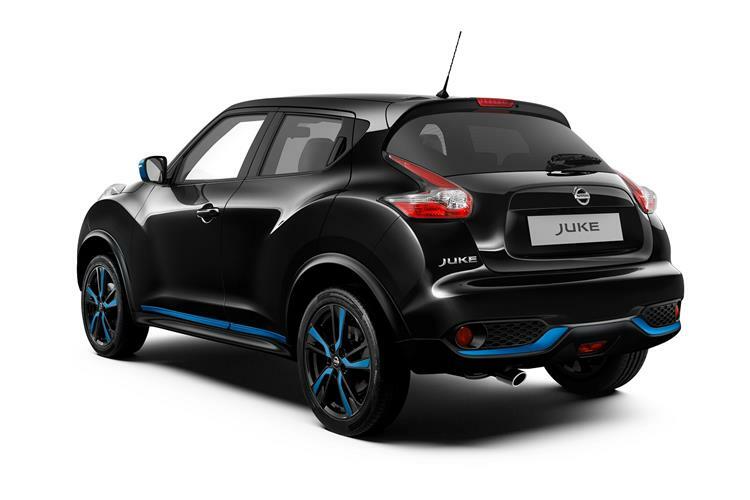 Perhaps the Juke was originally destined to be an outlier, but went mainstream in a big way. Whatever, it's here, it's hard to ignore and it's been updated to keep buyers interested. 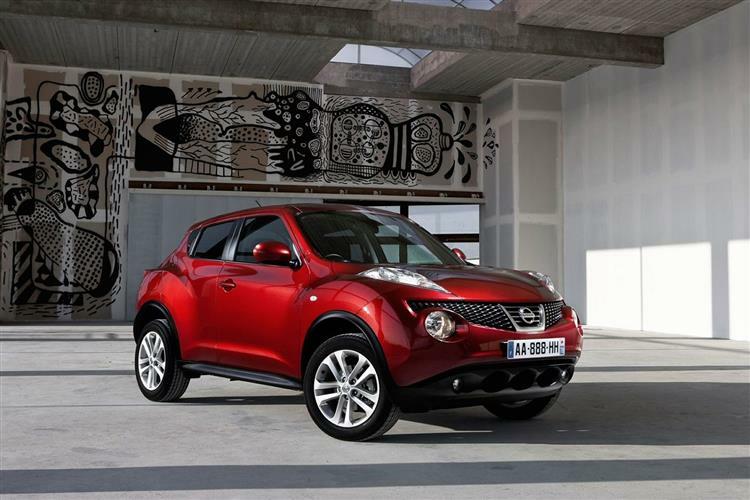 What is most amazing about the Juke is that a company the size of Nissan could build it. The usual procedure is for a maverick designer to come up with just such a concept only for octogenarian company heads to shelve it, for customer clinics to reject it or for marketing pressure to water it down. Somehow the Juke survived all of these potential trapdoors and remains singularly the most distinctive family car on sale today. There's no change beneath the bonnet, so as before, the range kicks off with an old-tech 94bhp petrol 1.6-litre unit that most buyers rightly ignore, which slots in below the 115bhp 1.2 DIG-T petrol unit that the majority want. Despite its modest size, this 1197cc turbo four packs a real punch, offering much sharper acceleration and greater torque (190Nm) than the base unit. Unfortunately though, you can't have a 1.2-litre DIG-T Juke with auto transmission: at the foot of the range, you'll need the base 1.6-litre variant for that. Need a diesel engine? Well there's also a 110PS 1.5-litre dCi diesel if you want it. At the top of the range, a minority-interest 1.6 DIG-T turbo petrol unit produces 190PS and is available in both front and all-wheel drive versions. Go for an all-wheel drive variant and you have the option to specify the Xtronic auto transmission gearbox we mentioned earlier, which further improves fuel efficiency and acceleration. The Juke's elevated stance but diminutive overall length doesn't promise a stellar driving experience but within a few yards, you'll realise that this is a fun car to hustle about. Nissan Dynamic Control helps here; an advanced driver control system giving the choice of three different driving modes, Normal, Sport or Eco, along with instant driving information and vehicle setting controls. The torque vectoring system on the all-wheel drive model incorporates technology that Nissan initially used to devastating effect on their GT-R supercar-slayer. 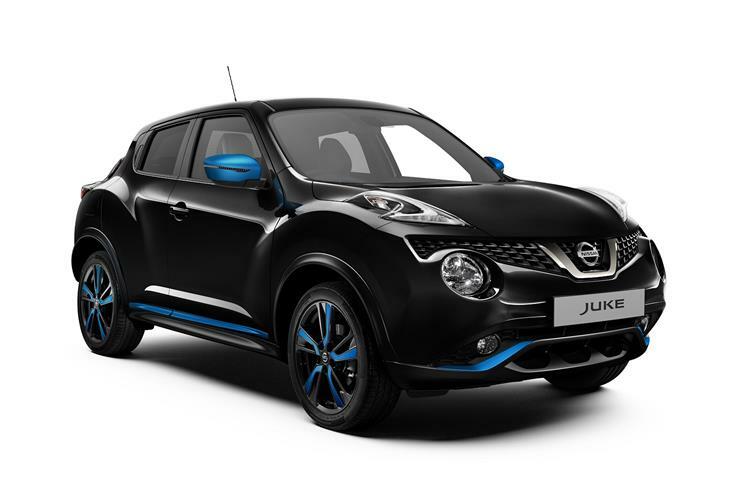 Yes, the Juke does still look like either something dredged up from the abyssal depths of the ocean or a fun, friendly and futuristic little runabout, depending on your perspective. Whichever camp you're in, you have to hand it to Nissan for not losing its resolve and watering this design down. Changes made to this revised model include a more striking dark chrome V-motion grille, dark headlamp trimming and dark turn indicators on the door mirrors. And there's an even wider range of vibrant body colours: 'Sunlight Yellow' metallic is sure to continue to be popular with those who resolutely refuse to blend in. Nissan also offers coloured inserts which can be applied to the mirror caps, side sills, roof spoiler and door handles in order to further personalise the exterior. Inside there's a motorbike-style central console and features such as that console, door trims and other elements can be individually coloured red, white, black, orange, blue or even bright yellow. Back seat space is pretty limited by class standards: so is boot capacity - 354-litres in total. Still, versatility can be further enhanced with a flat folding rear seat, making it easier to load large objects, while the inclusion of a two-stage floor in the luggage area makes the space on offer more flexible. Juke pricing starts at about £15,500 but that only gets you the rather slow and inefficient base petrol 1.6-litre variant. If budget permits, it's better to see around £16,000 as a realistic price starting point, the sum necessary to get the least expensive 1.2-litre DIG-T version. You'll need at least around £17,000 for the least expensive diesel variant. These are very competitive prices by small SUV standards. And it's not as if the Juke is lacking in equipment either. Four grades are now on offer - 'Visia', 'Acenta', 'BOSE Personal Edition' and 'Tekna'. Every Nissan Juke comes with air-conditioning, electrically adjusting door mirrors, front and rear power windows, LED daytime running lights and a CD audio unit with aux port as standard. 'Acenta' grade adds the driving modes of the 'Nissan Dynamic Control System', plus front fog lamps, cruise control with a speed limiter, automatic air-conditioning, privacy glass, a USB port and Bluetooth connectivity. The 'BOSE Personal Edition' variants include a clever audio system, while 'Tekna' trim gives you leather upholstery. You'll need one of those top two spec options to get the interior personalisation that many owners want. That's a package that now includes two new colours - 'Energy Orange' and 'Power Blue'. These further enhance the design of the central console, air vents, door inserts and seat upholstery. The updated Juke is looking to retain its predecessor's reputation as being inexpensive to run. The 1.2-litre turbo petrol engine makes good use of its lower weight, standard automatic Stop/Start feature and fuel-efficient operation, delivering 128g/km of CO2 and returning a combined fuel consumption figure of 49.6mpg. The 1.6-litre DIG-T petrol unit features emissions of 139g/km of CO2 for the 2WD versions. All give best to the diesel engine which returns better than 70mpg on the combined cycle. Insurance is very competitive too, with an opening rating of 8E for the base petrol 1.6. Due in no small part to its distinctive personality, residual values have been a few points beefier than in many typical superminis. CAP Monitor quotes residual values of between 52 and 54 per cent after three years/60,000 miles, even outstripping the MINI hatchback by a good few points. You probably know the guy who complains that all new cars look the same but has nothing good to say when Nissan brings out something different and fresh. Don't be that guy. The Juke has deservedly carved itself a lucrative niche for itself with an inexpensive vehicle that drives well, is cheap to run and which isn't afraid to assert its own personality. The latest changes don't alter that fundamental appeal but smartening the front end and adding more equipment certainly isn't going to do the Juke's prospects any harm. Should Nissan have gone a little further with the exterior changes? I'm not so sure. 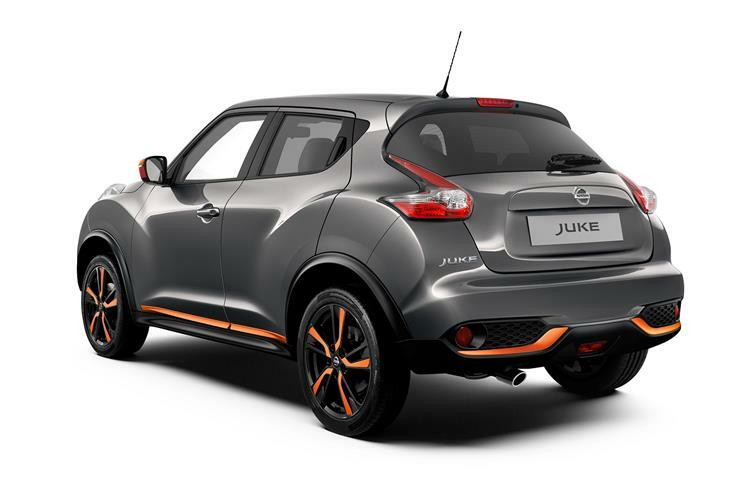 The Juke was already an extreme-looking thing and going overboard with styling updates would have smacked of trying too hard. As it stands, it'll continue to be the car that none of its rivals have come close to answering. * Prices shown based on 6 month initial payment. * This deal is subject to a £100+vat document fee. All Rights Reserved. Company Reg: 4410376. Address: Plan (Head Office), 1st & 2nd Floor, 78 High Street, Epping, Essex, CM16 4AE. VAT: 801 840 52. DPL No: Z8186498 Vehicles shown are for illustration purposes only. Vehicle pricing is correct as of publication. We reserve the right to withdraw any product, service or price without notice. Vehicle quotations already include an administration fee. Errors and omissions excepted. Plan (GB) Ltd are authorised and regulated by the Finance Conduct Authority, licence number 683206. Plan is a registered trading style of Plan (GB) Ltd. Registered Office: 78 High Street, Epping, Essex, CM16 4AE. Request a call back from one of our experienced and friendly advisors. We will give you a call at a time that suits you.